Premise: The film explores the last two years of Princess Diana's life, after her divorce from Prince Charles. I know nothing of Princess Diana’s life, or the politics surrounding it. The extent of my Diana knowledge comes from one of her interviews. I forget what it was about, but I just remember the exhaustion in Diana's eyes; like she had the weight of the world pressing on her. Going in to see "Diana" I found myself in the rare position of not having seen any footage from the movie. The only thing I went in aware of was the scathing critical response, and I couldn't imagine why the film's reception was so impugning. How could "Diana" hold a 9% approval rating on Rotten Tomatoes? A 9% approval rating is lower than some truly dreadful films: "Dumb and Dumberer", "After Earth", "The Love Guru", "Valentine's Day", "Batman & Robin", "Freddy Got Fingered". "Diana" was on my radar before its release, but after I became aware of the tremendously negative reaction, my excitement to see it was intensified. Watching "Diana", was I bored for a single minute? No. Even though I didn't like certain aspects of it, it was engrossing. Was it melodramatic? So melodramatic. But to work, in its current state, the film needed to be histrionic on some level. Some parts of the film are just plain inspiring (Diana walking across the land mine field comes to mind.) The cinematography, gorgeous. The press' apalling treatment of Diana is a particular highlight (they treated her worse than an animal.) 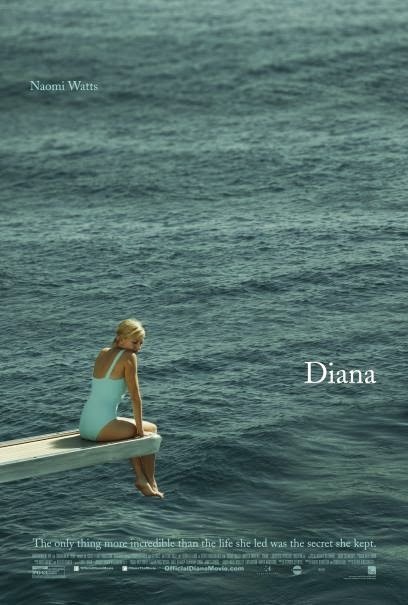 Until the last twenty minutes or so the narrative was clear, but near the end, "Diana" did lose me. The film's biggest weakness is the relationship between Diana and Hasnat Khan, played by Naveen Andrews. (Hasnat is a heart surgeon who saves lives, but he's a dead character with no heart. Ironic.) There is no chemistry, no attraction, between Hasnat and Diana, and their relationship is utterly hollow. Diana is infatuated by Hasnat from the start, for no reason. Their interaction becomes more contrived and absurd as the film progresses. Worsening it all, Naveen Andrews' efforts are pathetic, and he is godawful in the film. The portrayal of Diana is another issue. I'm not talking about Naomi Watts, who I enjoyed (her performance was very entertaining.) But rather, the head-scratching portrait put together by the writer and director. Diana is most often shown as neurotic, selfish, immature, and media-obsessed. But then she randomly switches gears, becoming a humanitarian martyr, flying across the world to visit children with blown off limbs, trying to rid the world of landmines. The way Diana is portrayed, fiction or not, is baffling. Very contradictory and confusing. The thing that audience members need to look past is the historical accuracy of Diana (there is none). But that does not automatically make it a bad film. If anyone watches this film and mistakes it for literal history, the fault lays not with the filmmakers; it lays with the ignorant, obtuse person. Looking past the repugnant Hasnat components, I really enjoyed the film. For anyone going into it, have an open mind. "Diana" is a fun one, if you have the patience to decipher it.